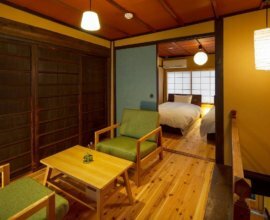 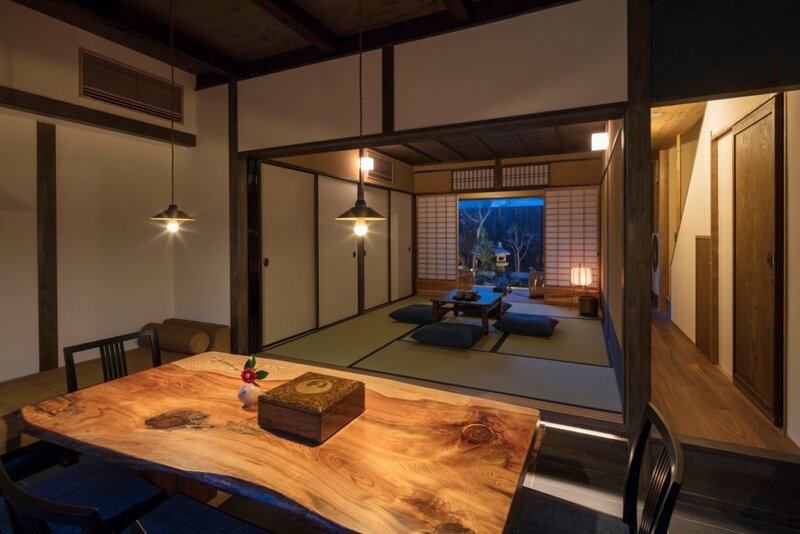 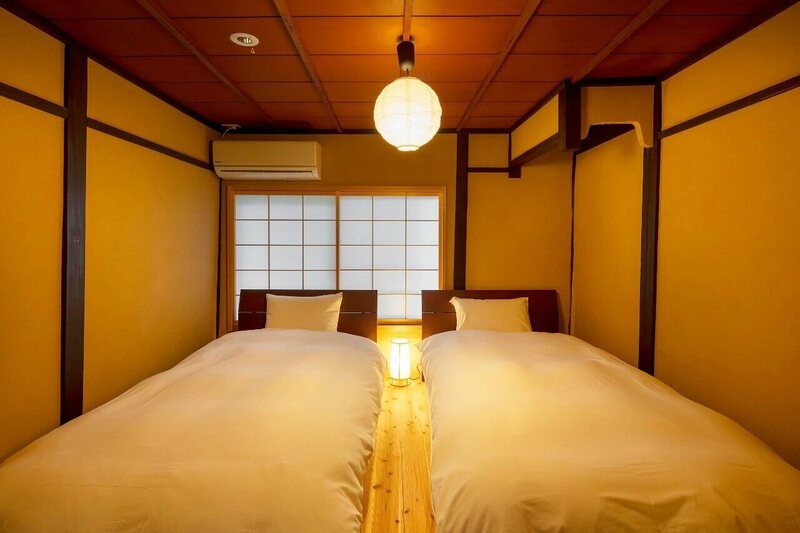 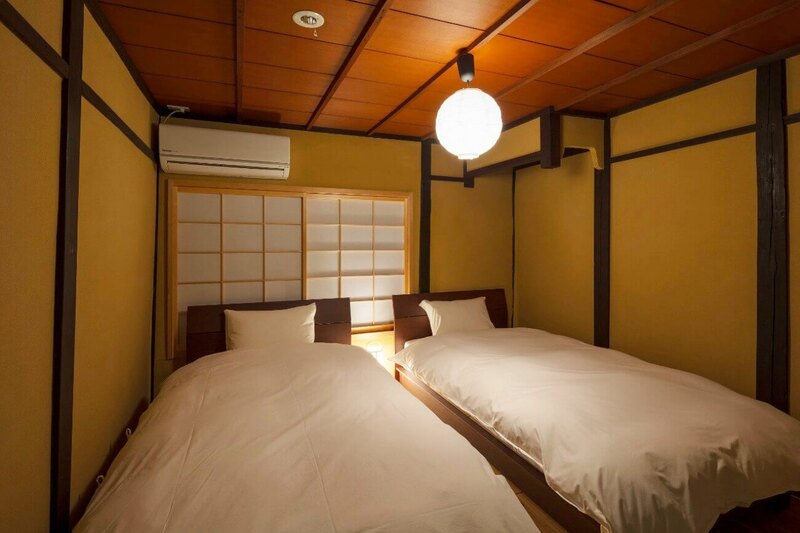 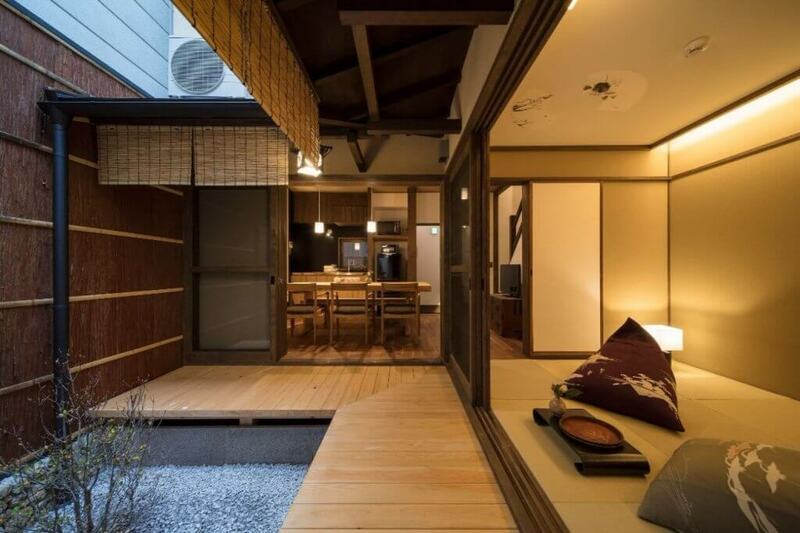 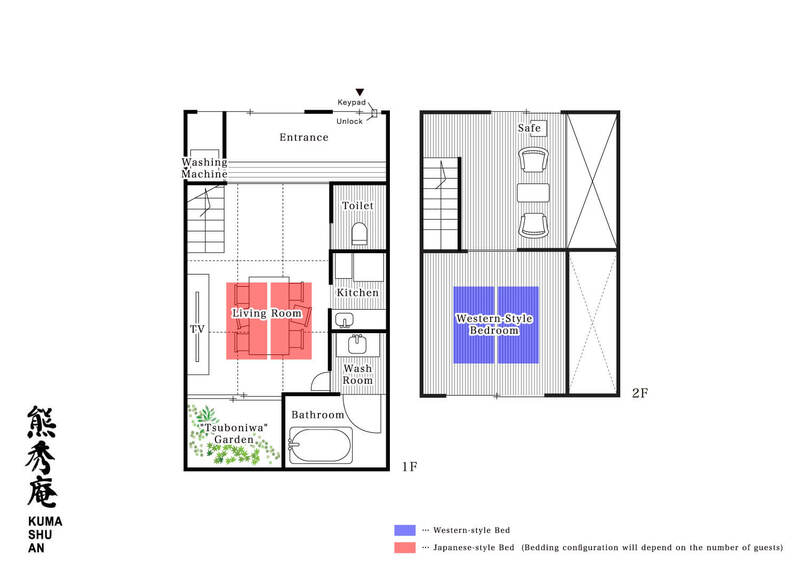 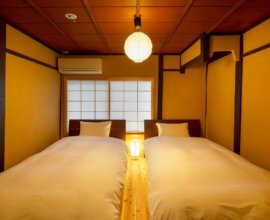 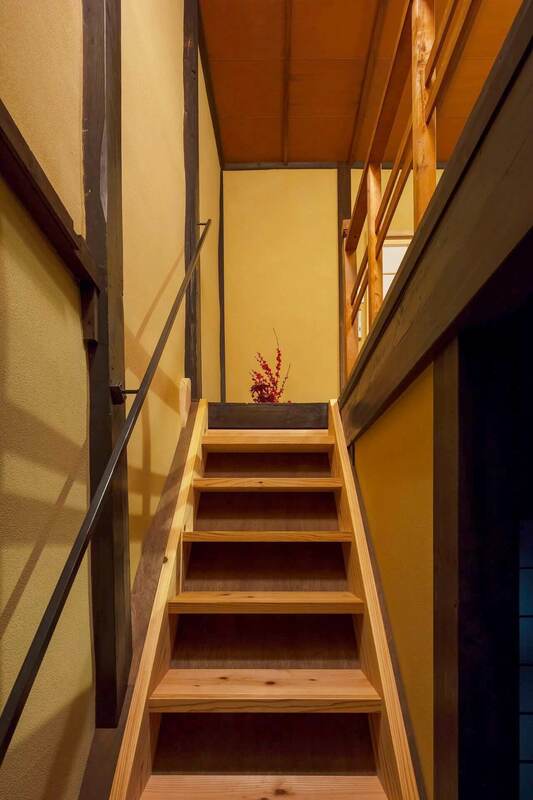 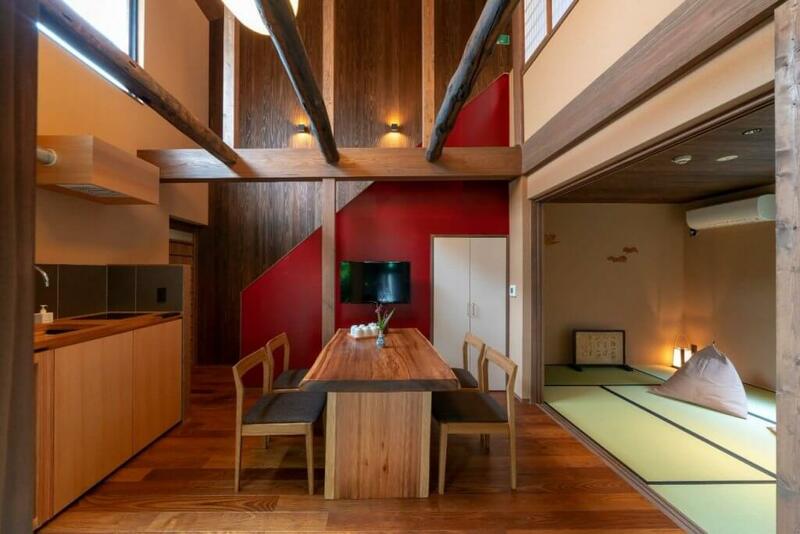 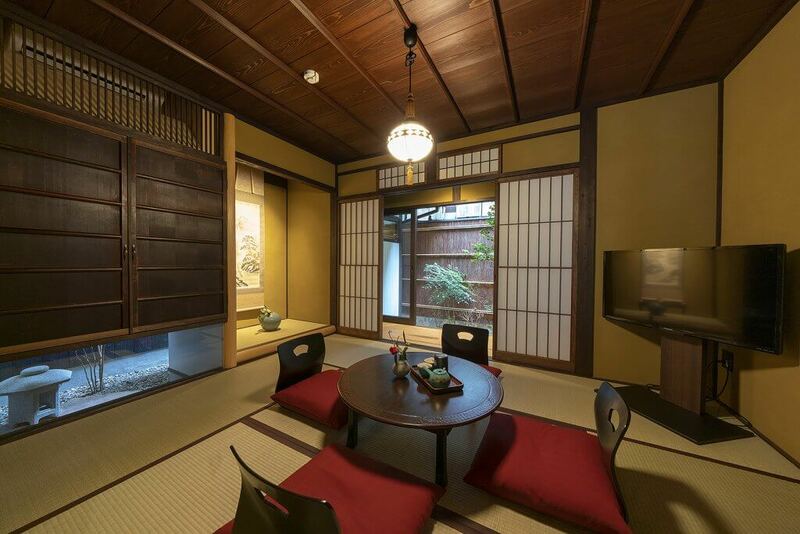 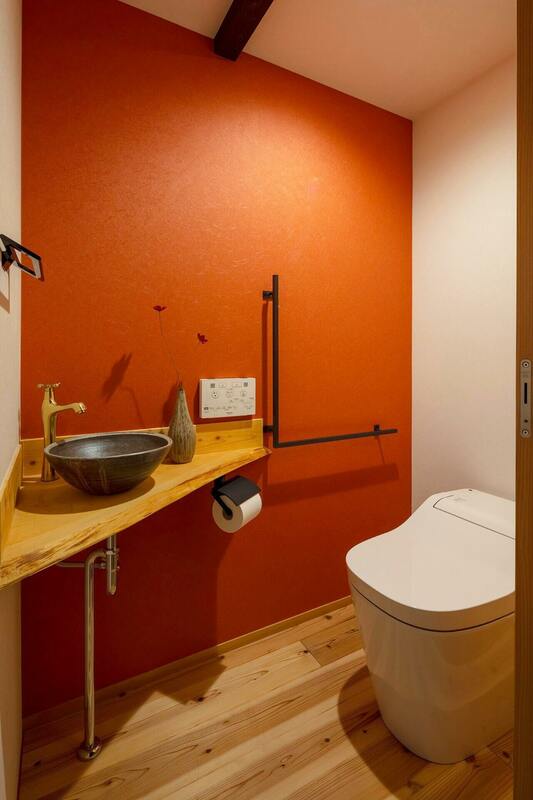 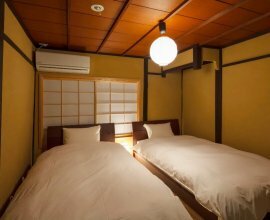 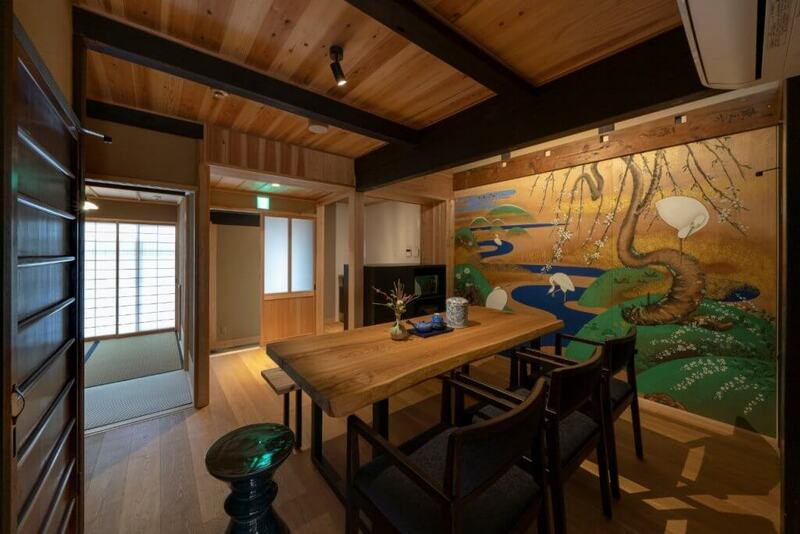 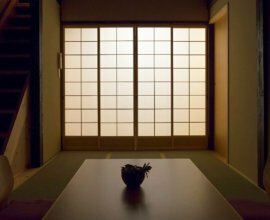 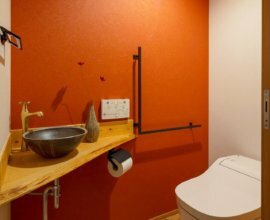 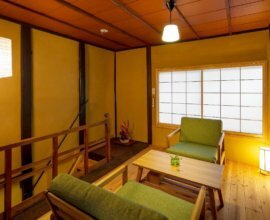 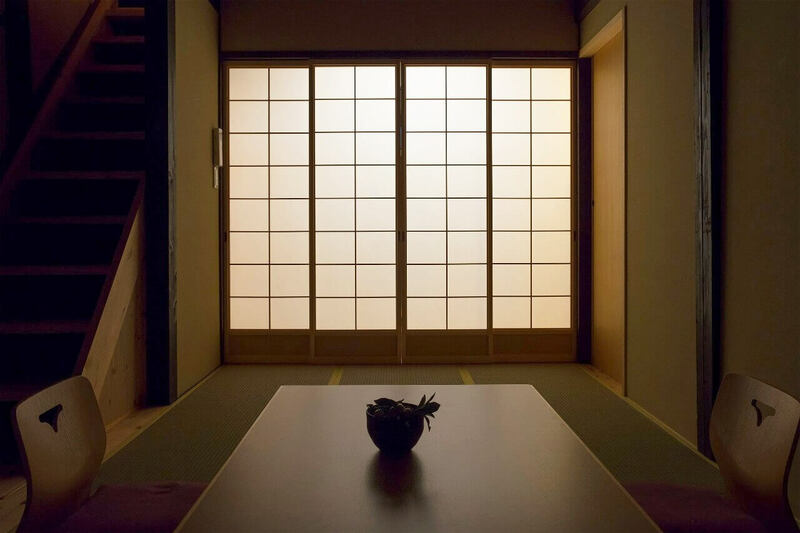 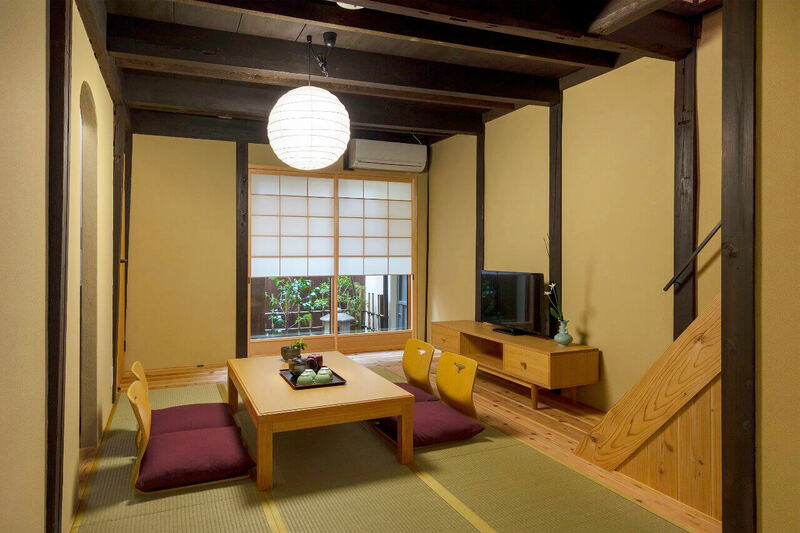 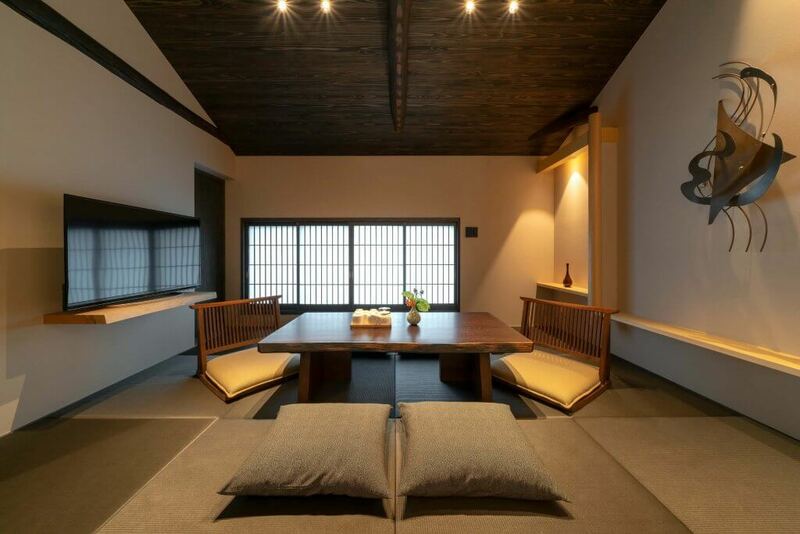 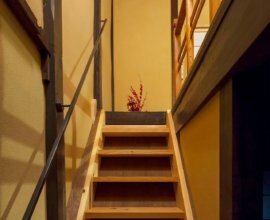 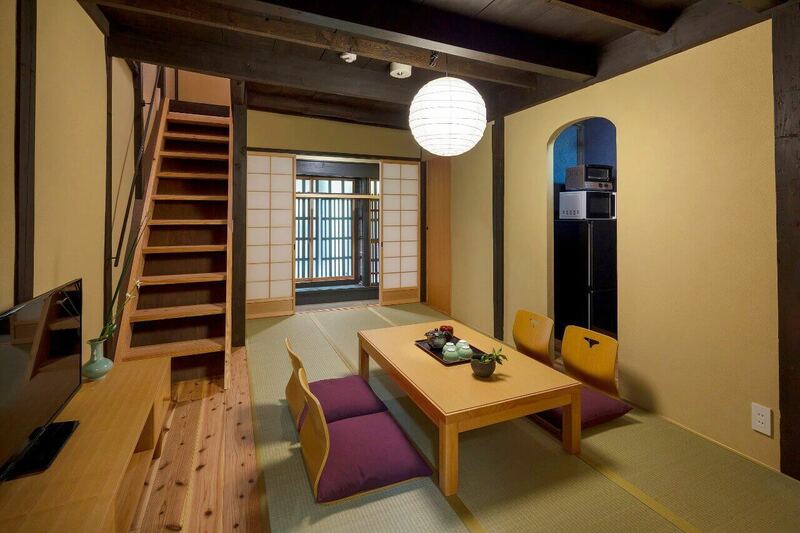 This charming machiya house can accommodate up to 4 guests. 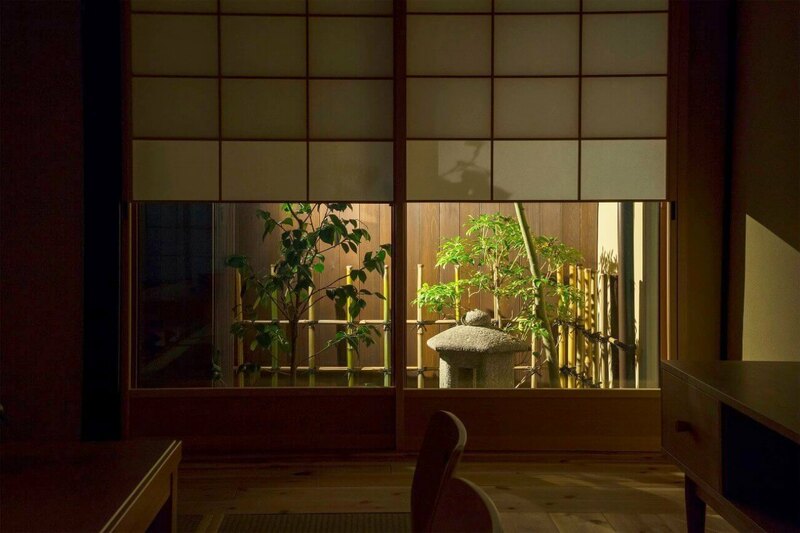 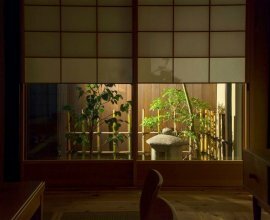 From the tsuboniwa garden, to the hibukuro chimney -- each detail of this house has been carefully preserved to illustrate the beauty of the kyo-machiya house. 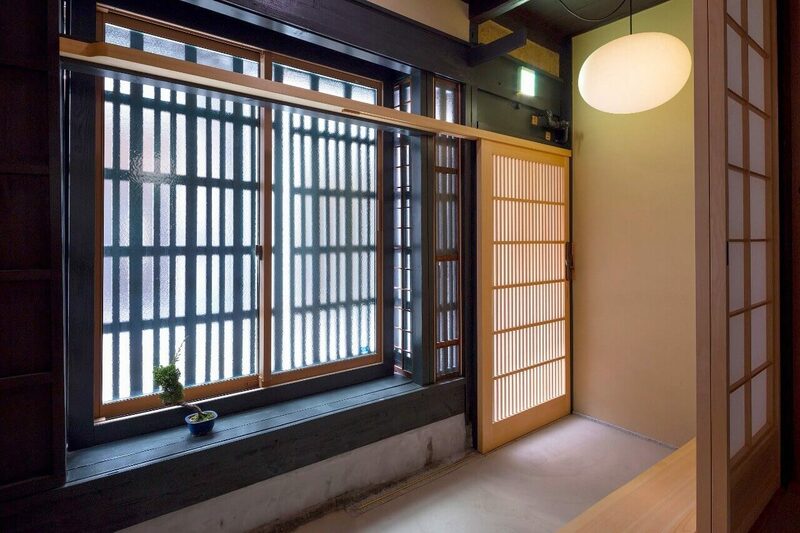 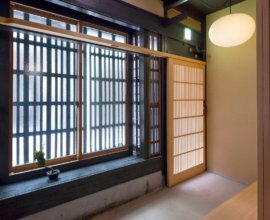 The exterior boasts lattice windows, while the interior features tatami mat flooring and earthen walls to provide a warm and inviting atmosphere. 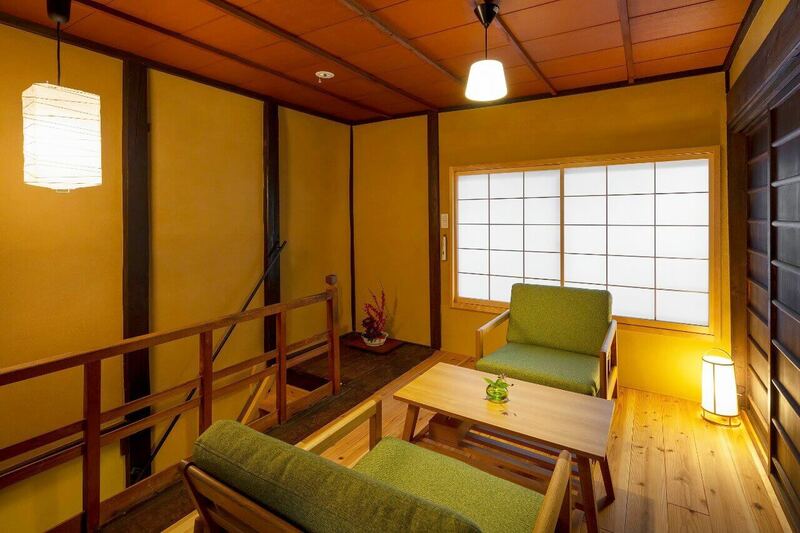 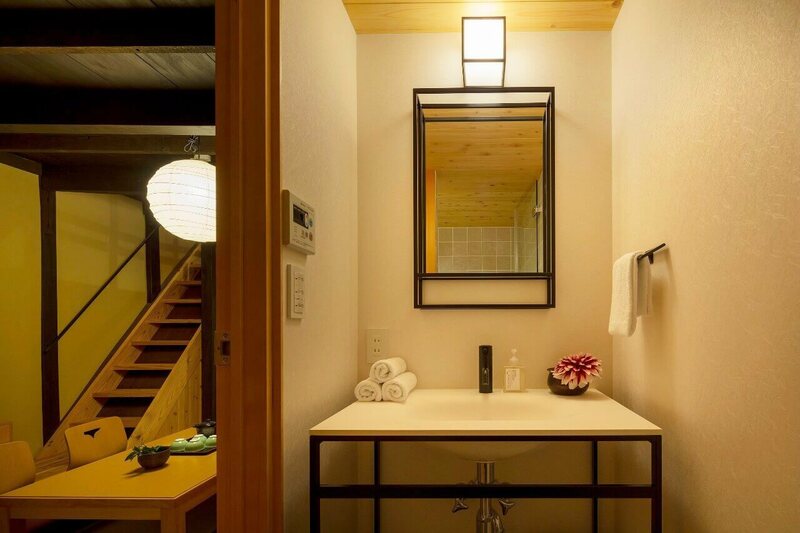 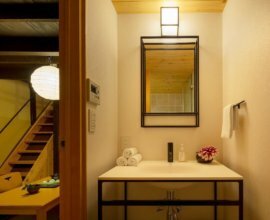 This house is ideal for smaller groups of family and friends looking for an intimate and relaxing space during your time in Kyoto. 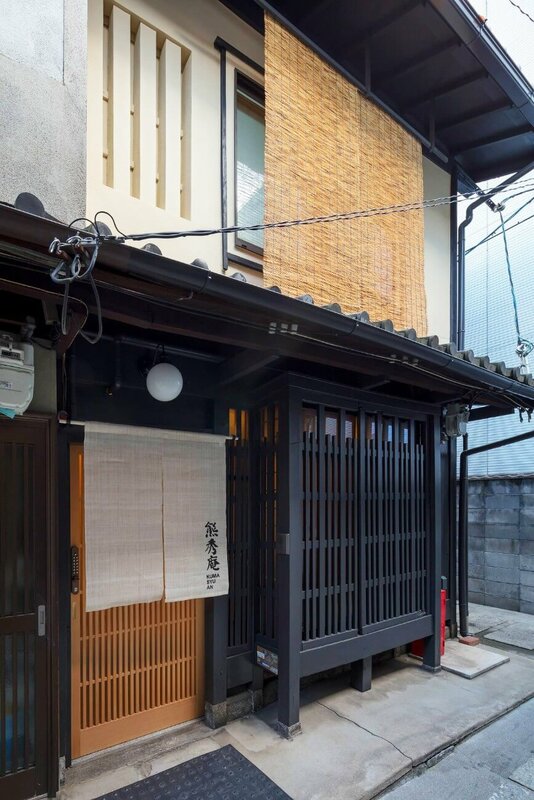 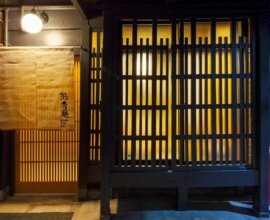 Koshi Latticework A traditional architectural feature of machiya houses, wooden lattice creates a striking and mysterious exterior that transports you into traditional Japan. 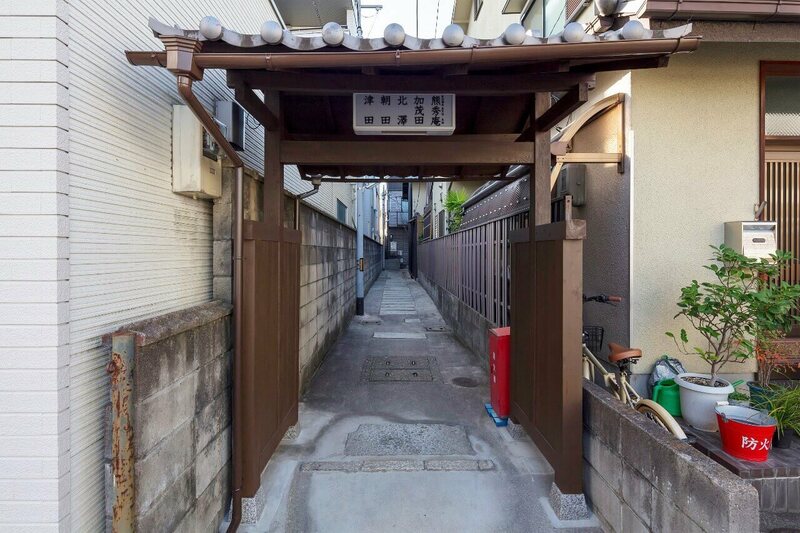 A Traditional, Vibrant Machiya Enter this machiya and find delight. 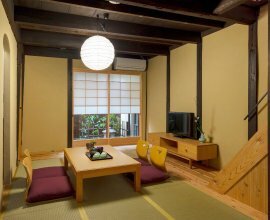 Playful splashes of colour add freshness to each of the rooms and pair perfectly with the black lattice exterior and rich woodwork. 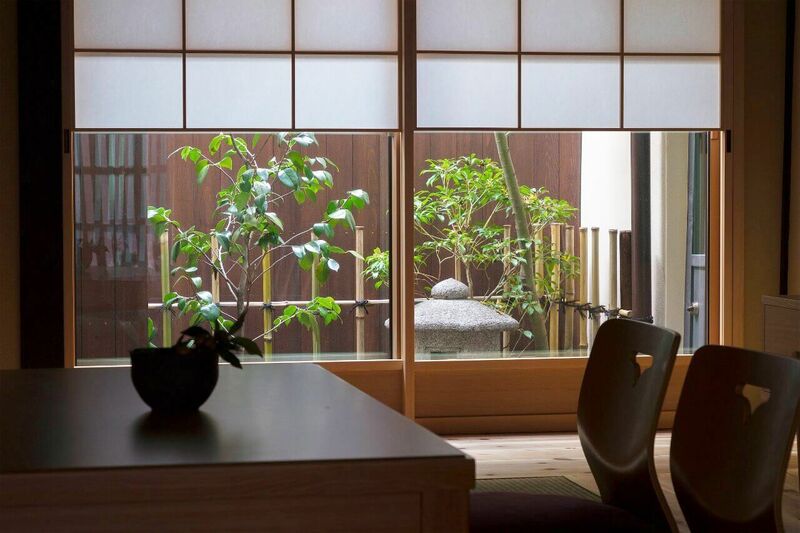 The Heart of the Home From the living room, gaze out onto the garden and bask in the natural light pouring through the lattice. 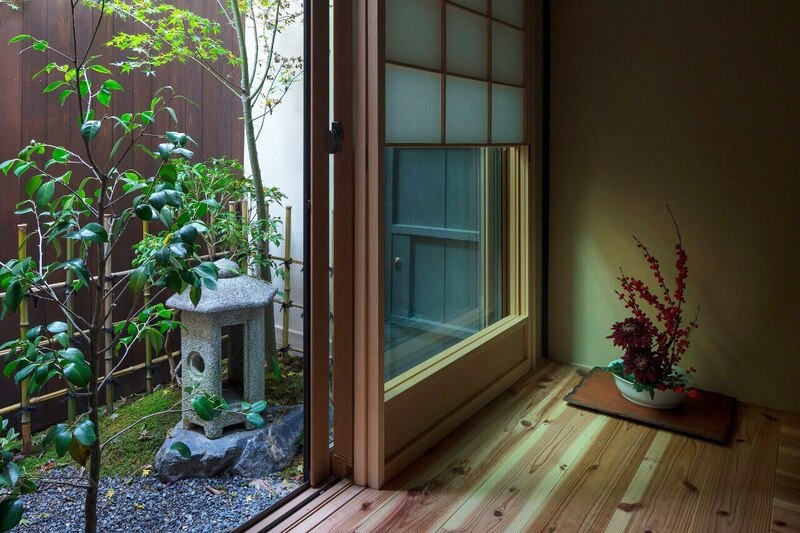 Relax here and relive today's adventures as you enjoy a meal and sip on a cup of tea. 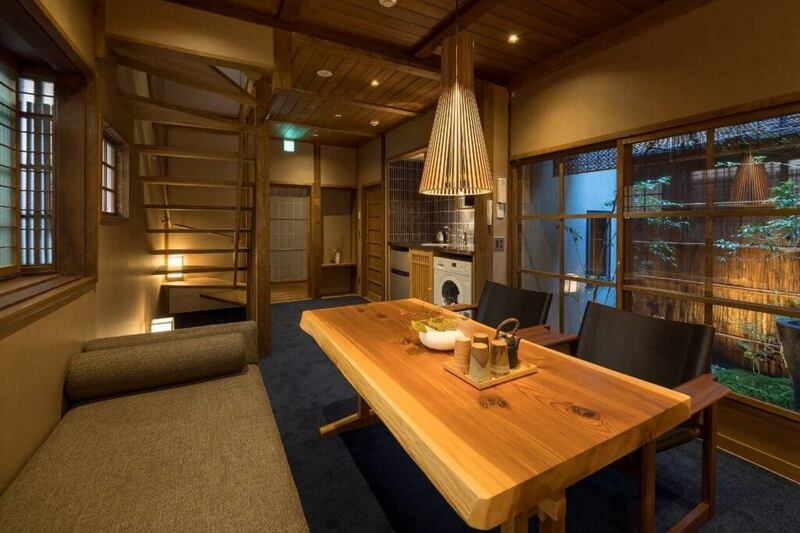 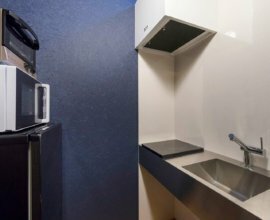 Kitchen Prepare your favourite light meal in the alcove kitchen, which is covered in traditional blue washi paper. 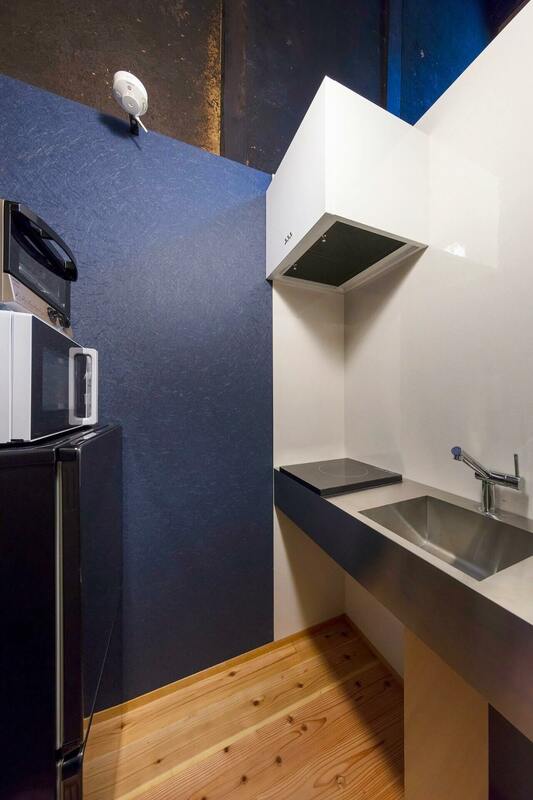 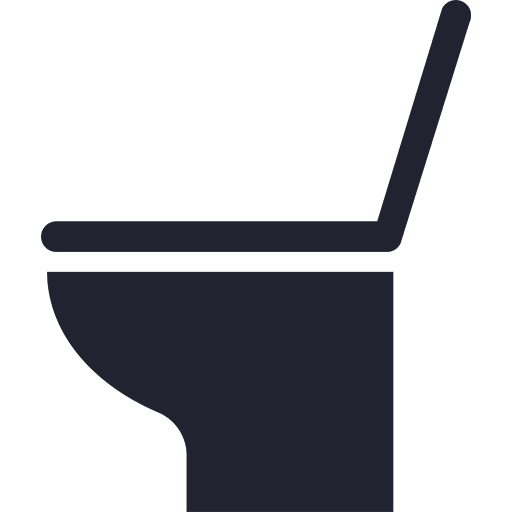 From the stovetop, tableware and more, you have everything you need here. 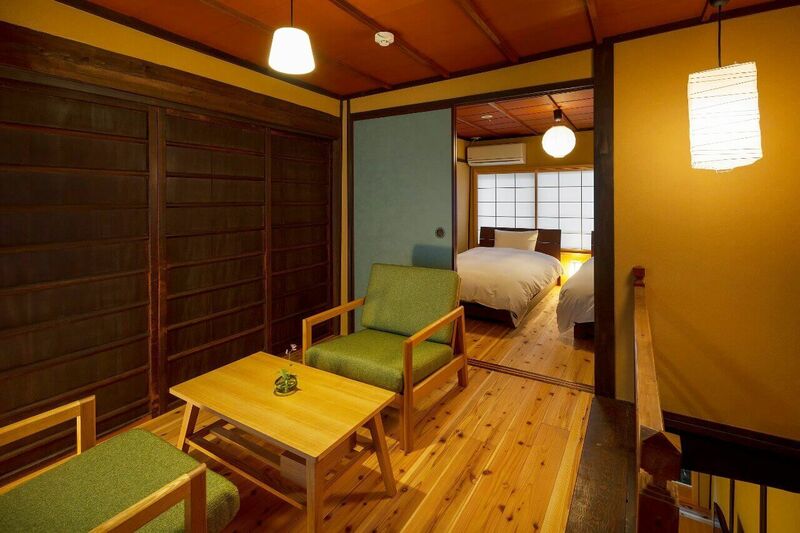 Western-Style Bedroom Push aside the pale blue fusuma doors to reveal the bedroom. 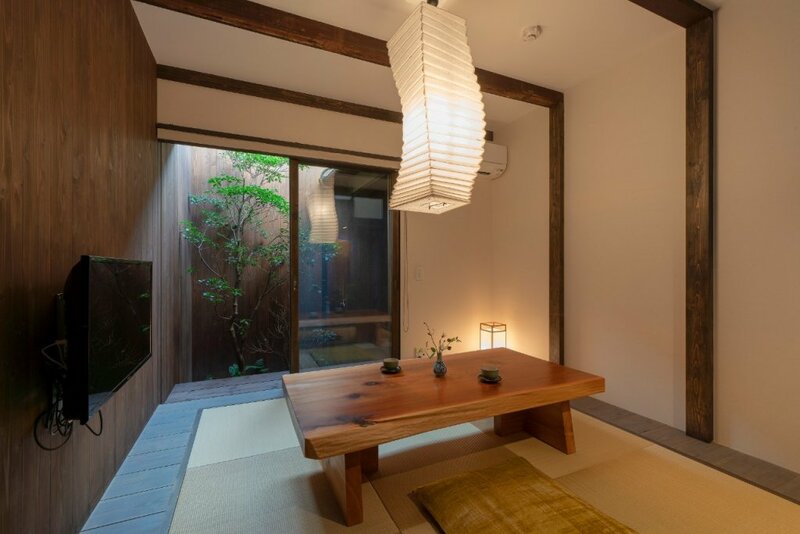 The brick red ceiling and wooden flooring are illuminated by traditional paper lanterns, creating a warm and inviting space. 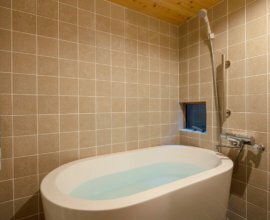 Bathroom Tiled from floor to ceiling, pamper yourself with custom bath amenities in a room that features a cyprus wooden ceiling. 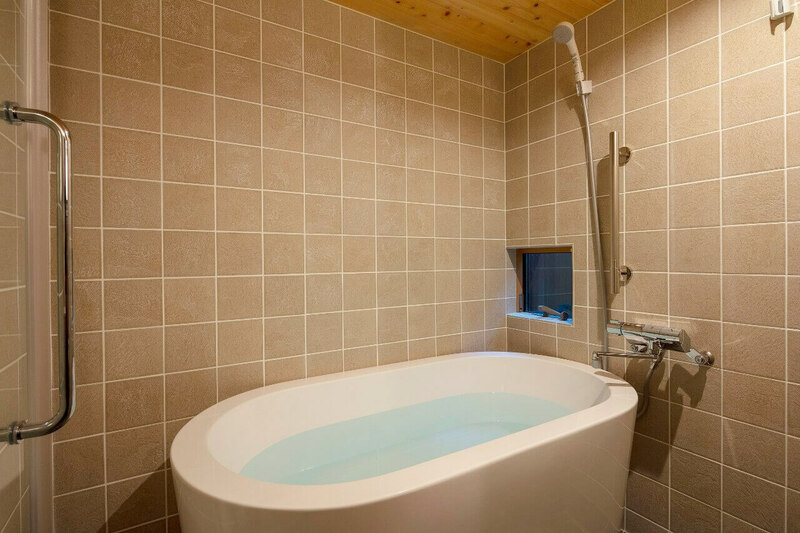 Soak in the large tub and rejuvenate under the shower. 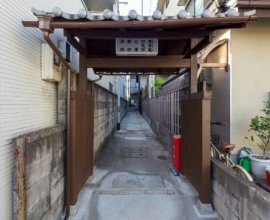 A traditional machiya tucked away within a quiet neighborhood 4 minutes from Nijo Castle. 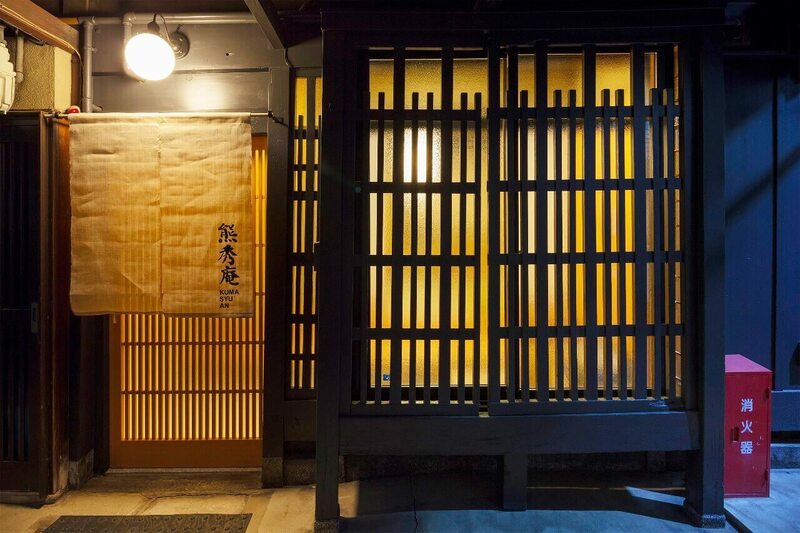 Take the Kyoto City Subway to the west, and find yourself in Arashiyama. 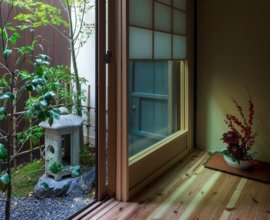 You'll be able to explore the lush green bamboo forests, marvel at the mountains, and appreciate the Tenryuji Temple and gardens. 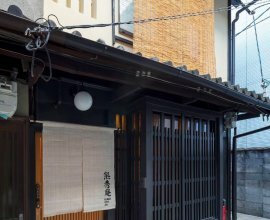 Head east to find yourself in Gion, and the Higashiyama Area -- where streets are filled with shrines, stone cobbled streets and rows of traditional houses. 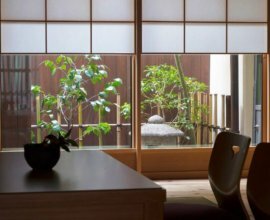 Venture north towards the Imperial Palace -- the heart of the city, and with impressive ground filled with cherry blossom & plum blossom trees.